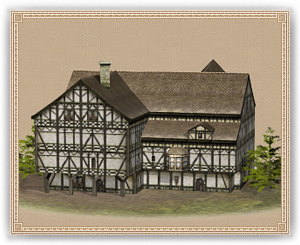 When mercantile trade starts to flourish in a city, the Merchants’ Guild house is the sign that the guild heads have seen the potential in the place. The building itself serves as clerical headquarters for the guild to administrate trade in the region, bringing higher profits in thanks to the guild’s broad connections. Merchants trained in this city are more likely to be skilled and educated.